Just over 100 cyclists and one very loud sound system rode around the Kings Cross gyratory in central London last night, in protest at recent road layout designs which, campaigners say, do too little to improve cyclist safety. 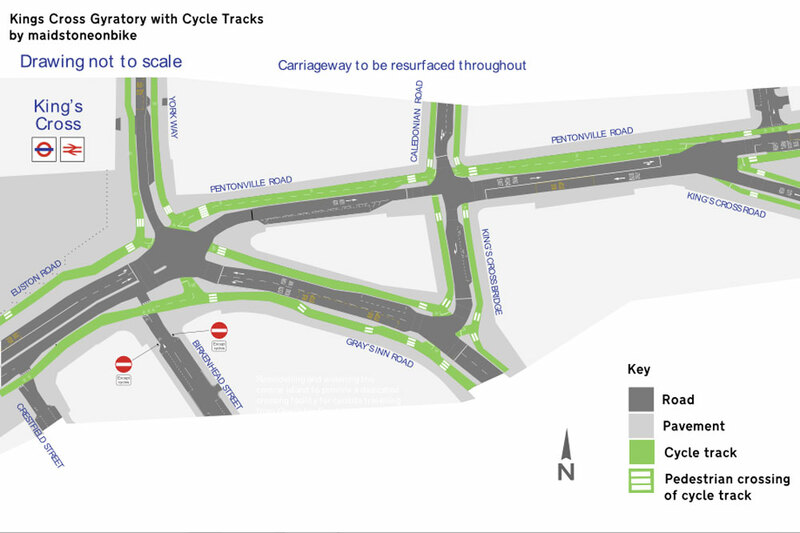 Transport for London’s (TfL) designs for Kings Cross, where two cyclists have died, show cycle lanes which disappear at junctions carrying up to five lanes of motor traffic, including many construction lorries and buses. One cycle campaigner, meanwhile, has reimagined the junction with continuous protected cycle tracks. A London Cycling Campaign (LCC) spokesman says he believes Transport for London is resisting making greater improvements now as the gyratory will be removed in the next ten years. A speech by cycle campaigner and organiser, James Gower, who reimagined the junction in response to TfL designs (See blog here), was read by fellow campaigners as he was unable to attend due to illness. It said: “The reason we are all here is that Transport for London propose changes to the Kings Cross gyratory, changes that have been sold as ‘improvements for cycling'”. In several parts of TfL’s designs motor traffic lanes have become protected cycle lanes, but these tend to disappear at junctions, or at the York Way entrance from the main junction where a cyclist was killed, take a detour via the pavement onto a two-stage crossing, likely to make navigating the junction slow for cyclists. Protester Andrew Smith, an actuary who commutes 50km by bike each day, said he feels roads designers aren’t properly trained in providing for cyclists. TfL say the works at Kings Cross is an interim solution, while they work out the best way to improve the road system at Kings Cross. Alan Bristow, Director of Road Space Management at Transport for London (TfL) said: “Following a public consultation earlier this year, work to deliver interim safety improvements for cyclists at King’s Cross will begin later this year.